Here are a few vital recent releases from Ace (nearly all issued on delectable vinyl), probably one of the best reissue labels in the world. A beautifully packaged three-track EP, featuring three previously unreleased cuts by the 1960s girl group The Carolines, kicks off this overview of the latest Ace releases. These glorious 1966 recordings are quintessential examples of the girl group genre, featuring sisters Trisha and Evie Patane, Sylvia Torres and leader Carell Mancusco, who contributes a brief biography of the band on the sleeve, in which she reveals that the group were named after her nickname. The songs are produced by Larry Weiss, who wrote Glen Campbell’s huge hit, ‘Rhinestone Cowboy’, and discovered the Carolines as they were relaxing on Jones Beach, Long Island, practicing their songs on a beach blanket. Weiss bequeathed the Carolines the Phil Spector Wall of Sound treatment when they recorded his numbers ‘Can’t Stop Lovin’ The Boy’ and ‘You’re My Baby’ for the Roulette label in ’66. Yet somehow these three songs on this EP languished in Weiss vault for over half a century. The composition on the A-side, ‘Big House’, was written by Weiss and its full-blown melodrama is two minutes and fifty-seven seconds of girl group perfection. 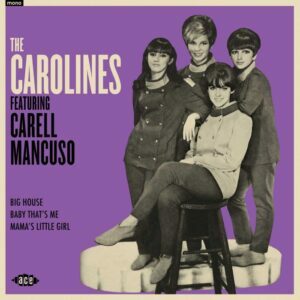 The Carolines’ renditions of the numbers on the flipside – the Jackie DeShannon/ Jack Nitzsche song ‘Baby That’s Me’ (previously recorded by The Paris Sisters, The Fashions and The Cake) and Chip Taylor’s ‘Mama’s Little Girl’ – are of an equally high standard. If you dig the mid 60s girl group vibe, you need The Carolines EP in your life. As the title indicates, this is a 2018 remix project, undertaken by acclaimed producer Steve Levine and Ace Records co-founder Roger Armstrong. The objective is bringing some of soul superstar Millie Jackson’s classic 1970s cuts (seven tracks on the vinyl and 12 on the CD), recorded for the Southbound label, into sharper relief for the 21stcentury. Discernibly a labour of love for both Levine and Armstrong, Exposed commendably does not radically alter the tracks that Jackson recorded with The Swampers at Muscle Shoals in the 70s. Rather Levine and Armstrong suitably highlight the power of Jackson’s sometimes underrated voice and the hypnotic propulsion of the tracks they have chosen to remix. Of course, the vinyl version of the project is the one to purchase. Opening with the amplified grooving featured on the fabulous Millie Jackson and Isaac Hayes duet ‘Sweet Music, Soft Lights and You’ (originally issued on their 1979 team-up album, Royal Rappin’s), Exposed features some of Millie Jackson’s very best work. The dismay at witnessing social injustice is centre stage on the entrancing mix of the 1973 track ‘I Cry’, while the definitive Jackson tracks ‘If Loving You Is Wrong (I Don’t Want to Be Right)’, taken from the epic bestselling 1974 concept album Caught Up, the upbeat ‘My Man, A Sweet Man’ and the 1973 hit single ‘It Hurts So Good’ are given even greater clarity. 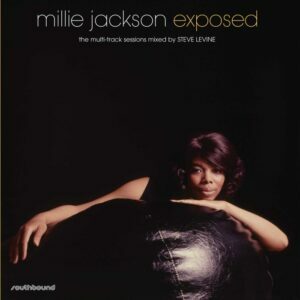 Exposed will hopefully introduce a whole new audience to Millie Jackson’s recordings and stands as a solid ‘Best of’ package. Compiled and noted by Ady Croasdell, this splendid Kent/Ace vinyl-only compilation, featuring 12 tracks that the late, great soul singer/songwriter Mary Love (1946-2013) recorded for the Modern label and two for her own CoLove label, between 1965 and 1988. Having barely survived a horrendous childhood and adolescence, a talent competition, a change of name and a recording contract for the Bihari brothers Modern label in the mid-1960s led to Mary Ann Allen’s salvation. Such Modern classics as the uplifting ‘You Turned My Bitter into Sweet’, the compelling title track of this compilation, the soaring ‘Baby, I’ll Come’ and the joyous ‘Dance, Children, Dance’ defined the idiosyncratic Love sound and brought her some success. In the late 60s Love recorded further abiding versions of her compositions for the Elco label. However, by the 1970s, Love’s career was primarily confined to LA nightclubs, but she still moved with industry heavyweight figures such as Lou Rawls and Barry White. Her friendship with the legendary comic/singer Rudy Ray Moore led to Love’s move into movies, appearing and performing the smouldering numbers in Moore’s 1975 blaxploitation opus, Dolemite. Love would also contribute five songs to Moore’s 1977 flick, Petey Wheatstraw. In the 1980s Mary Love became a born-again Christian and married Chicago keyboard player Brad Corner, with whom she formed the CoLove label. The final tracks on this album reflect this period; the spirited ‘Come Out of The Sandbox’ and the dramatic ballad ‘The Price’. The indomitable spirit of Mary Love runs through the core of all these tracks included on Lay This Burden Down. 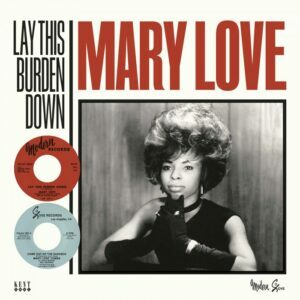 Mary Love was the quintessence of soul music, an enduring talent for the ages. This record is an essential purchase, providing abundant evidence that Love was one of the all-time great Northern Soul stars. Compiled and noted by Ady Croasdell, this is a crucial Kent/Ace vinyl compilation of rare ‘New Breed’ R&B and danceable soulful blues numbers that fill the dance floors of numerous ‘retro’ clubs across the UK. 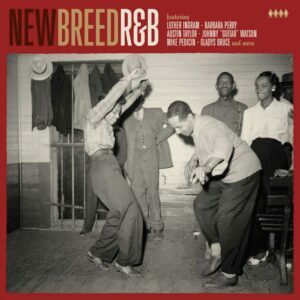 Unbelievably, Ace/Kent have compiled six CDs worth of ’New Breed’ R&B since 2001 (coining the term in the process) with most tracks drawn from the early and mid-1960s, with a handful from the mid-50s and many previously unreleased cuts from various labels. A vinyl LP overview of the series was long overdue and New Breed R&B doesn’t disappoint. New Breed R&B covers the thrilling period when rhythm & blues was slowly mutating into funky soul, but what unites this genre is an irrepressible, unflappable groove. Side One opens in high style with the best version of Fred Bridges’ dynamic song ‘Oh Baby Don’t You Weep’, performed by Luther Ingram, a soul singing star at the beginning of his career. Austin Taylor’s driving ‘Why O Why’ and Johnny “Guitar” Watson’s 1964 dance work out ‘I Say I Love You’ are thrilling, while blues master B. B. King shows that he knew what was going down in 1967. Mike Pedicin’s propulsive 1961 groover ‘Burnt Toast and Black Coffee’ is the essence of New Breed R&B. Side Two is similarly exhilarating. The Charmaines’ joyful black girl group version of Ike Turner’s rockin’ ‘I Idolize You’ was due to be released on Fraternity in 1964, but it was far too wild for the label. Subsequently, the cut lay gathering dust until Kent issued it, 40 years later. Barbara Perry’s ‘A Man Is A Mean Thing’ is as rapid and agitated as R&B gets, which is probably why Goldwax didn’t release it in the 60s. The Phillips Sisters hit hard with Kent Harris’ accusatory 1964 number ‘Where Did You Stay Last Night’ while Bobby Mitchell’s 1959 song ‘Well, I Done Got Over It’ anticipates the shuffling rhythm of James Brown’s version of ‘Night Train’ two years ahead. Fraternity would partly redeem themselves in 1968 by releasing Albert Washington & The Kings funky blues workout, ‘I’m The Man’, which brings New Breed R&B to a rousing close. Hopefully, there will be a second New Breed R&B issued on vinyl in the not too distant future. A very welcome CD reissue of two mid-1960s loungecore classic Verve albums by suave vibes player, composer, arranger and producer, Gary McFarland. McFarland’s easy on the ear and intoxicating mix of Latin music, vocal harmony, covers of film soundtracks and Beatles and Rolling Stones covers dismayed the jazz cognoscenti when initially released. Today, they stand as the perfect laidback soundtrack to a long hot summer. McFarland, after serving in the US Army, attending the Lenox School of Jazz and one-semester studying music at Berklee, travelled to New York to make his name as a composer. This he achieved when such luminaries as the Modern Jazz Quartet, Gerry Mulligan and Johnny Hodges covered his material. This success drew the interest of famed Verve producer Creed Taylor, which led McFarland arranging for singer Anita O’ Day, Stan Getz and recording his own albums for the label, including his version of Frank Loesser’s musical, How To Succeed In Business Without Really Trying and the acclaimed The Gary McFarland Orchestra – Special Guest Soloist: Bill Evans. Then McFarland recorded Soft Samba (1964) followed the next year by The In Sound. McFarland’s act of openly embracing humming the hits of the day with a bossa nova beat, accompanied by the man who had popularised the bossa sound across the globe, Brazil composer Antonio Carlos Jobim, enraged jazz critics everywhere. They hated his upbeat versions of John Barry’s Bond theme ‘From Russia With Love’ and The Beatles’ ‘She Loves You’, ‘And I Love Her’, ‘A Hard Day’s Night’ and ‘I Want To Hold Your Hand’. Yet Soft Samba enjoyed considerable commercial success for a jazz artist, ensuring McFarland enjoyed a lucrative career until his mysterious and untimely death at the age of 38 in 1971. For the follow-up, The In Sound, McFarland increased the jazz content with a string of his own numbers (‘The Hills Of Verdugo’, ‘Over Easy’, ‘Fried Bananas’), but the Latin rhythmic impulse and pop covers (The Rolling Stones’ ‘(I Can’t Get No) Satisfaction’, Bacharach and David’s ‘Here I Am’) remained. 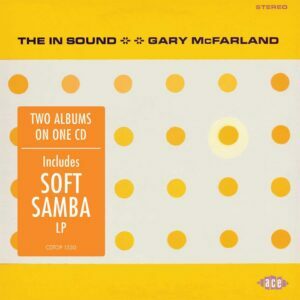 The In Sound, effortlessly crossed jazz with pop, featuring the prodigiously talented guitarist Gabor Szabo, and would prove to be one of the greatest albums of McFarland’s career. The jazz critics remained supercilious, while the general listening audience didn’t respond in such numbers as they had to Soft Samba. Both critics and punters really missed McFarland’s ironic take on pop culture in the 60s. In the 1990s, artists such as Air and Stereolab did not overlook McFarland’s artistry and humour, taking his music as a primary influence. Be sure to check out Gary McFarland’s cool samba world, with a suitably chilled alcoholic libation.